Four newcomers have joined cabinet, while Selinger changed and/or added to the portfolios of six existing cabinet members. 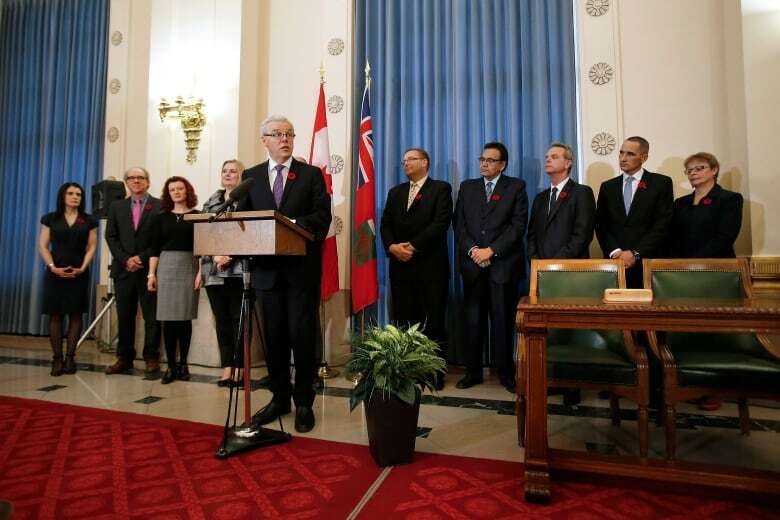 Manitoba Premier Greg Selinger announces his ministers during a swearing-in ceremony of his new cabinet at the Manitoba Legislature in Winnipeg on Monday. (John Woods/Canadian Press)​Dewar, the Selkirk MLA, replaces Howard as finance minister. The appointment marks his first cabinet post. During the ceremony, Selinger said Dewar brings "deep experience as a member of the legislature," including five years as vice-chair of the public accounts committee, five years on the treasury board and two years as the legislative assistant to the finance minister. Caldwell, the Brandon East MLA, had previously served in cabinet from 1999 to 2003. He replaces Struthers as the minister of municipal government. The audience cheered and clapped as the premier introduced Eric Robinson, who receives additional duties in cabinet, as "the first-ever aboriginal minister responsible for Manitoba Hydro." A news release detailing the changes was sent out a couple of hours after the five ministers resigned, saying they had lost confidence in Selinger's leadership. The changes mean the cabinet is reduced to 18 ministers from 19. James Allum, minister of justice. Sharon Blady, minister of health. Kevin Chief, minister of jobs and the economy. Kerri Irvin-Ross, minister of housing and community development, minister responsible for persons with disabilities. Eric Robinson, minister responsible for Manitoba Hydro. Peter Bjornson, minister of education and advanced learning. While Selinger is hoping the cabinet shuffle will settle the internal revolt, opposition leaders say an election is needed to resolve the matter once and for all. Liberal Leader Rana Bokhari said Selinger should call an election immediately and let Manitobans decide the best direction for the province. "It is apparent that the NDP government is going through unprecedented turmoil. Five of the government's key ministries have lost their leaders and the premier seems determined to continue forward with business as usual," Bokhari stated in a news release Monday. "Unfortunately that is impossible. There has been no call for a fall session thus far. The NDP has long been out of touch with the people of this province and with the resignation of five of their most senior ministers, Premier Selinger and the NDP have lost the faith of Manitobans." Marcy Markusa: Anyone else frustrated with the political power struggle?